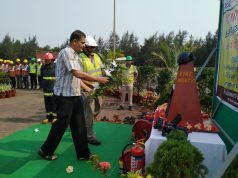 Angul: Hundreds of employees including the top-executives of Jindal Steel and Power Ltd. (JSPL) took the oath for safe workplace practice in presence of the Dy. Director of Factories and Boilers Mr. Ramesh Chandra Behera and Assistant Director Mr. U. K. Samantaray. Executive Director (I/c) and Location Head of JSPL’s Angul unit Mr. Atul Misra administered the oath as a monthly corporate practice and safety culture of JSPL. Mr. Misra, reiterated JSPL’s commitment to make the plant an accident free zone. On this occasion Mr. Ramesh Chandra Behera, appreciated the pledge and action taken by JSPL management for improving the safety culture of the organization and praised all the employees for giving their valuable time for the cause of safety. Mr. Damodar Mittal, Factory Manager and EVP Iron Making of JSPL, expressed his experience that how the India’s Largest 4 MTPA Blast Furnace has achieved a record braking production last month without any mishap or accident. On this occasion Mr. Samantaray, also advised everyone for adhering to the safety rules and practices and asked everyone to remember this oath every day, every time, while they are inside the plant or not. Mr. Ravikant Somani, Group OHS Head, thanked the senior executives for their perennial contributions and efforts to make this work place safer and better with each passing days. He informed about different actions taken to improve the safety rating of plants. He also announced the result of the Safety Index. On this occasion the winners were also awarded with Trophy and prizes for their best safety practices.